Download yvTransliterate: JoomlaCode, local file (unzip before install). yvTransliterate is Transliteration plugin for Joomla! 1.5. The plugin transliterates article titles into aliases, taking into account "Content Language"of the Article (stored in metadata of the Article) and it also transliterates aliases of other elements of Joomla! site interface (menu items, sections, categories...), that are used in Search engine optimization (SEO) for creation of Search engine friendly (SEF) slugs (URLs). List of supported languages/transliteration tables is expandable with Language packs. As of 2009-02-27 yvTransliterate has transliterations for five languages: Czech, Hungarian, Russian, Slovak and Ukrainian, and it has 'Language pack template', that may be easily adapted for new languages. The extension may be used for the site, that uses only one non-English language, but it is especially useful and unique for multilingual sites, where different articles are written in different languages (even in one session by single user) and so, should be transliterated by different rules. It doesn't require any hack to the code of Joomla! 's core: you simply have to install one plugin and as many yvTransliterateLanguagePacks, as you need. yvTransliterate supports PHP5 only (although it may work under PHP4...). Donate to help sustain this project. If you have any problem, please read this page from the very top to the bottom - it is being maintained exactly for this purpose: to save your time, to make your questions answered and problems solved. In order to understand, what yvTransliterate is doing, you may turn on "Debugging mode" in parameters of the plugin. If you got this error message during installation of yvTransliterate: 'Error! Could not find an XML setup file in the package.' - this means, that you didn't read instructions below (in this case, Section "1. Installation of Joomla! and it's extension(s)"): yvTransliterate.zip is NOT installable file. To minimize chance of problems, my advice is to use PHP5 and MySQL5. And don't use "legacy mode" in Joomla! until it's absolutely necessary for you. Current version of yvTransliterate requires Joomla! 1.5.4 or newer. Moreover, it definitely doesn't work on older builds of Joomla! 1.5. So, if you have some problem, start with moving (at your test site, not at production site!) to the newest build of Joomla!. If you still have problem, please read messages in this Joomla! forum. Maybe, your questions were answered already. scenario (steps) to reproduce the problem. - and send your report to the JoomlaCode Tracker: we may discuss that bug there and ensure it won't be forgotten. Good luck and let's go! If you're not upgrading existing installation of yvTransliterate, please skip this section. The only reliable way to upgrade existing installation of yvTransliterate is to uninstall it (uninstall plugin), and then install new version (as it is described below). To upgrade language pack, you have to uninstall this language pack only and then install newer one. These are "yvTransliterate plugin" parameters, that are not preserved during upgrade, and you have to set them again after installation. To speed up setting of parameters (and to be sure, that you didn't forget something...), I recommend to open yvTransliterate plugin parameters in new window of your Internet browser before uninstall, leave it open, and use information from this window as a reference for setting parameters of newer version. After uninstallation of old version, installation and configuring of newer one, please close this "reference window". And don't press any buttons on it! In a case of any problem during installation, please refer to the Troubleshooting section above. It is recommended to have Joomla! 1.5.4 (Stable) or newer, because yvTransliterate is not tested to work with earlier builds of Joomla! (In any case you MUST have at least Joomla! 1.5.3. If this is not a case, do not waste your time trying to install yvTransliterate ). For each yvCommentLanguagePack, that you are planning to install, please install 'full' language pack of Joomla! for this language for Administrator interface, downloading it e.g. from Joomla! Accredited Translations. It is required to install "yvTransliterate Plugin"to install (download). Now you may continue to the "Preparing for configuration" below. Now you may continue to the "Step-by-step configuration" below. First thing to do is to open yvTransliterate plugin configuration page: in the menu Extensions->Plugin Manager->click "yvTransliterate" Plugin. You will see something similar to the picture to the right. "Extend content table" - set to "Yes" to allow yvTransliterate to add Article alias transliteration functionality without any patch of Joomla! core. Plugin integrates itself into the JTableContent::check() function, that is called just before Article (or Comment in a case of yvComment) is saved (after creation/editing). If alias is not empty, it does nothing (e.g. when user typed alias manually). If alias is empty, yvTransliterate transliterates article 'title' and puts result into 'alias'. So, it works naturally for new articles (if you leave alias empty!) or for old articles, if you clear alias before saving your article. "Extend JLanguage class" - set to "Yes" to allow yvTransliterate to add another 'hook' into Joomla! core. This allows yvTransliterate to transliterate not only aliases of Articles, but aliases of other elements of Joomla! site interface also: menu items, sections, categories... in fact, yvTransliterate works in every place, where Joomla! core calls JLanguage::transliterate method. Please note, that in this case yvTransliterate uses current Language of user interface (i.e. of current user) as source Language for transliteration. 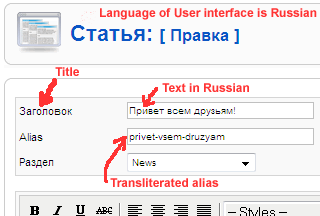 So, for example, if you want Section alias to be transliterated according to Russian transliteration table, you have to log in to Administrator site (backend) in Russian language. "Default content language" - If the value of this option was not selected, the language defaults to current Language of User interface. Group of settings, starting from "Debugging mode" is used in Debugging mode only, so there is no need in them until you can't understand, what's going on. Anyway "Transliteration name" should be left empty (so the plugin will use 'default' name). Enable plugin (in 'Details' box to the left set 'Enabled' option to 'Yes'). Save new configuration of the yvTransliterate Plugin. yvTransliterate doesn't require user (both in frontend and in backend) to explicitly set 'Content language' of the article, only if current language of User interface is the same as 'Content language' of the article. E.g., if you logged in Joomla! site and current language is Czech, yvTransliterate will use 'Czech to English' transliteration by default. If in this scenario, you want to create article in e.g. Russian language, you have to set 'Content language' of the article explicitly in order to tell yvTransliterate, that it needs to use "Russian to English" transliteration for this article. Currently built-in Joomla! 's "Submit an Article" menu item doesn't allow to set 'Content language' of the article in the frontend (there is no such an option in "Article Submission Layout"), so in the frontend yvTransliterate will work correctly for one language only: current language of user interface. If you found a bug in yvTransliterate, or even developed a fix for it; if you created new translation or updated existing one - please, send them to the author! If you want to discuss yvTransliterate with Joomla! community, please go to the Joomla! forum. Please refer to the "TODO" section below before posting Your suggestions. If you want to write your review of yvTransliterate or to read other user's reviews, please go to the Joomla! Extensions Directory. Please, help others to make the right choice ! If you want to take part in the development, you're welcome, and there is always work for you: you may start from reading TODO list below or propose your idea... In any case: please write me! This plugin is the result of the work, that was started in March 2007 (see the thread). I hoped, that this _real_ Transliteration functionality will be inserted in Joomla! 1.5 core, but it's not there yet (see 'Language slugs transliteration'). yvTransliterate has open and simple interface, that uses special triggered event, so it may also be used by (integrated in) any other Joomla! extension to transliterate text strings. yvTransliterate is written from scratch specifically for Joomla! 1.5 and it is not compatible with previous versions of Joomla!/Mambo. So it is free to use most advanced features of Joomla! 1.5. My intention is to build extension, that is as much "natural", native to Joomla, and that uses as much built-in (or existing) features (tools, extensions...), as possible. You may see full example in 'plugins/system/yvtransliterate/table_content/content.php' file. "Extend JLanguage class" option allows yvTransliterate to add another 'hook' into Joomla! core. This feature works MUCH more effective under PHP5 (it creates proxy to the JLanguage object instead of creating (and populating...) second instance of JLanguage class (this is done for PHP4). 'Default content language' option was added. If the value of this option was not selected, the language defaults to current Language of User interface (as it was before this release). Added another 'hook' into Joomla! core: parameter 'Extend JLanguage class'. Now yvTransliterate may transliterate not only aliases of Articles (or comments in a case of yvComment), but aliases of other elements of Joomla! site interface also: menu items, sections, categories... in fact, yvTransliterate works in every place, where Joomla! core calls JLanguage::transliterate method. Please note, that in this case yvTransliterate uses Language of current user as source Language for transliteration. So, for example, if you want Section alias to be transliterated according to Russian transliteration table, you have to log in to Administrator site (backend) in Russian language. This feature works MUCH more effective under PHP5 (it creates proxy to the JLanguage object instead of creating (and populating...) second instance of JLanguage class. Ukrainian (Thanks to Ary Group).